So, this is going to be a lot of short topics, bear with me. 1. The College Football Championship: Obviously, I'm bummed that UGA didn't win. Like a lot of people, I'm so completely over The University of Alabama. Also, as a UGA alumna, I kind of have to pull for my school. Next year, I swear. 2. Puppy Love: Last night, I woke up at some point and realized I had kind of forgotten what Lola was like. It's only been...five years? But I fell back asleep, and dreamed that Lola was there. I said, "There you are! See, I didn't forget you." In the dream, Piper and Lola were pals. It was comforting. I love that I had the dream. The mind is a powerful tool. 3. Ride Out the Crave I am on day three of sugarless life. And by that, I mean traditional sweets - cakes, cookies, candy, donuts... and so on. Now, I had a sugar free lime Jello today, and honestly, it was good, but I should probably avoid that, too. Although, I didn't get fat from Jello. I am eating a metric ton of fruit, and trying to avoid junk, so that's a good thing. 5. The Call: Shortly after dinner, I got a call from an 800 number. I answered it. It was a robocall from Kroger letting me know we may have purchased a product that has been recalled. Frozen motherforking biscuits. They may be contaminated with Listeria. Which, honestly, wouldn't affect any of us. But I went and checked the label for the lot number, and it would seem we're in the clear. Listeria. FFS. That feels like one of those thing (like Polio) that shouldn't happen now that we live in the twenty-first century. But what do I know? 6. Lego Belly: I do know that because I've spent the past three days eating raw vegetables, fresh fruit, oatmeal and nuts, my gut feels like it's full of Legos. Which of course, makes me wonder...what are the symptoms of Listeria. I know that my current state of bloat is because of massive doses of fiber, but I'll be aware of how I feel, just in case. 7. Skills to Pay the Bills: I got a bill from Northside Hospital, where I went to the ER for vertigo, and it was for $4600. Yeah. On TOP of the $400 I paid the night of my visit. This was pre-submission to insurance. Insurance paid all but $600 and change of it. So I'm going to call them tomorrow and see how much they can reduce it if I pay immediately. I never knew that was a thing, but then I heard someone mention it, and it is totally a thing. So, wish me luck. 8. Fructivore: So, since I'm giving up sweets, I have been hitting the fruit HARD. 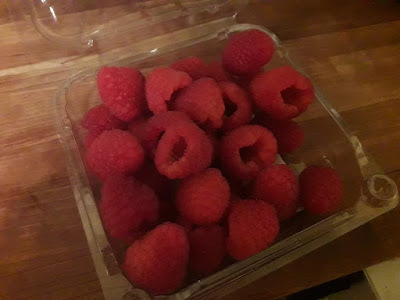 Raspberries are excellent, huge and cheapish at the moment. Like eating rubies. Honestly, so good. I also bought myself an apple slicer. This one makes 16 thin slices and I am in love with it. Fabulous. But here's the big news. Sumo Oranges are BAAAAAACK! They're bumpy, and weird looking and amazing. I bought twenty. 8. Weather and Traffic on the 8s: We have some bad weather possibly heading our way in the next 48 hours. I personally hope it passes us by. As much fun as it would be to do nothing all weekend, that's not really practical. Although, Piper just adores snow, and I adore Piper, so there's that. Hmmm. OK - as long as it doesn't mess up my commute. Dog on lap. Good night. An interesting but totally unrelated fact about listeria: "young" cheeses--that is, cheeses that haven't been aged very long and still have active cultures--are banned in the U.S. They're primarily made in France and Spain. The argument is they may contain listeria, but cases in both countries are extremely rare and the biggest outbreaks of listeria among developed nations happen in the U.S.
Take from that what you wish. I'm still giddy over your Spinal Tap reference.